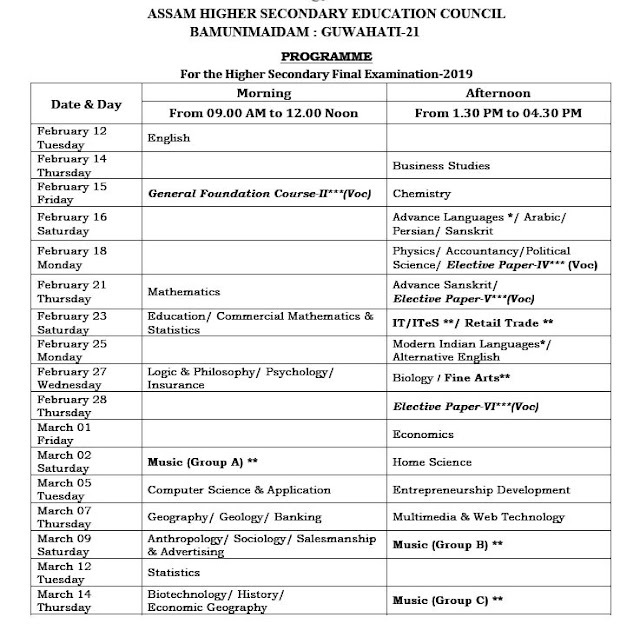 Assam AHSEC Board Higher Secondary Final Year Genral, Vocational Examination Time Table 2019 Download from www.ahsec.nic.in website. Assam Higher Secondary Education Council conducting Higher Secondary 2nd Year both General and Vocational Examinations from 12th February 2019 to 14th March 2019. First examination starts with English Paper on 12th February 2019 and end with Biotechnology, History, Economic Geography Papers on 14th March 2019. The students can download the examination time table from given below links. *Modern Indian Languages include: Assamese, Bengali, Bodo, Garo, Hmar, Hindi, Khasi, Manipuri, Mizo, Nepali & Urdu.